Fr. James (right) and Fr. Richard-Jacob Forcier, OFM Conv., the Spiritual Guardian of the Companions. In anticipation of his presence at the Papal Mass in Washington, DC, Minister Provincial Fr. James McCurry, OFM Conv. offered to carry with him to that special Mass the prayer intentions that our Companions shared with us through the mail and through our Facebook page. Pictured here, in the presence of these handwritten and online prayer petitions, Fr. James and Fr. Richard-Jacob Forcier, OFM Conv., the Spiritual Guardian of the Companions, bless a replica of Pope Francis’ Good Shepherd cross, that it will symbolize the special intention which each Companion shared with us. Fr. James carried this blessed cross with him to the Papal Mass at the National Shrine of the Immaculate Conception in Washington, DC on September 23, 2015. There, he and Fr. Michael Heine, OFM Conv., Director of the Shrine of St. Anthony in Ellicott City, Maryland concelebrated Mass with Pope Francis. Fr. James held the blessed replica of Pope Francis’ Good Shepherd cross—and the special intentions of all our Companions—close to his heart during the celebration of the liturgy. 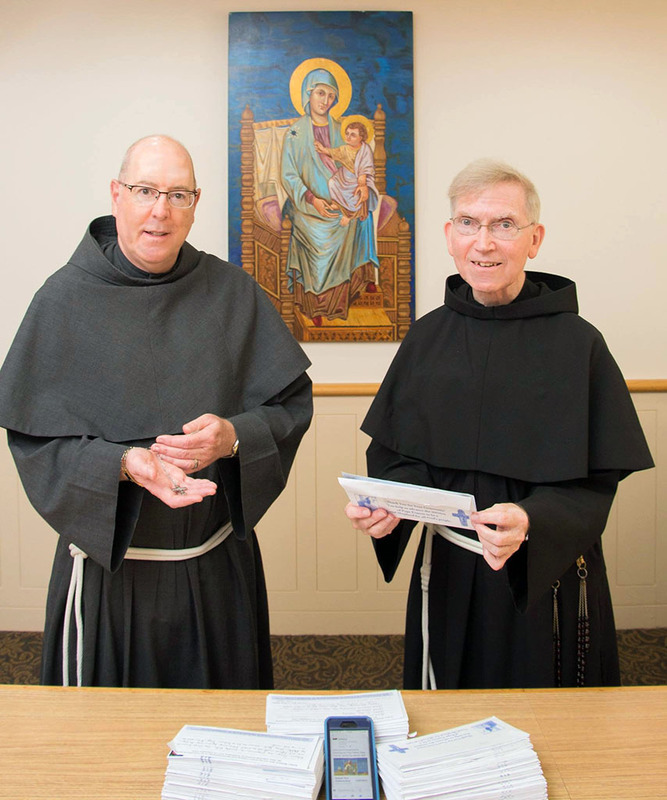 Thank you for sharing your prayer petitions with the Friars!